If you are a Mother, like me or you are a Father, unlike me, you will appreciate what I am going to tell you about today's egg masala. In fact even if you are not a parent you should certainly appreciate the wisdom imparted in the post. you will really really appreciate a peek into my cheat sheet. 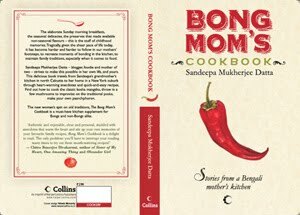 At least I did, when years ago in my noveau blogging days I had landed on the blogs which showed me how to make the "All Purpose Masala". Those had saved my life on many busy evenings. But as it happens one day you are making and freezing masalas like a maniac and then next you are not. I still make ginger-garlic paste and fried onion pastes but for a while I had not frozen these all purpose masalas. 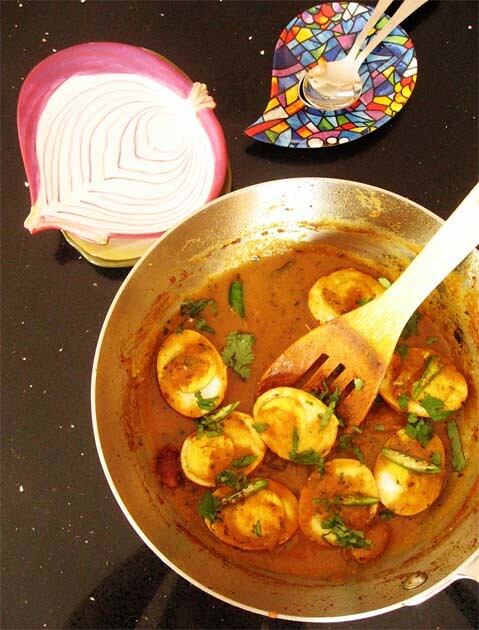 Then when I made this egg masala a few days ago, I did it again. Only I did not have any more ice trays, so I just froze a portion enough for two curries. And did it help me on a busy Wednesday. Phewwww. I saved so much time that if I wanted I could have got a pedicure done. But of course I didn't. The pedicure I mean. Instead I read a book. The Hindi-Bindi Club by Monica Pradhan being one of them and Yes Chef by Marc Samuelson the other. So what is your cheat sheet ? Now we will make an ubiquitous, everyday masala with this. 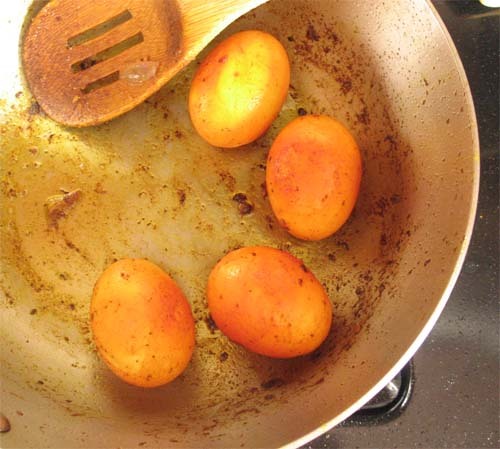 Heat 1-2 tsp of Olive oil in a frying pan. 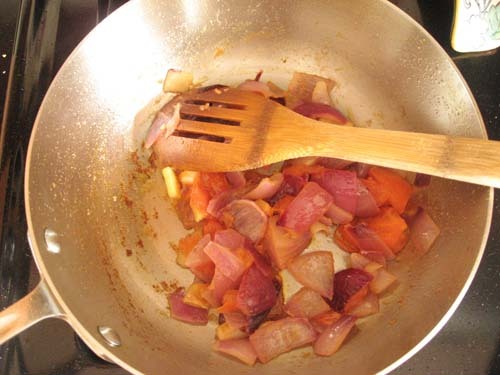 Add the above chopped onion-tomato etc.. Saute. Sprinkle some salt. 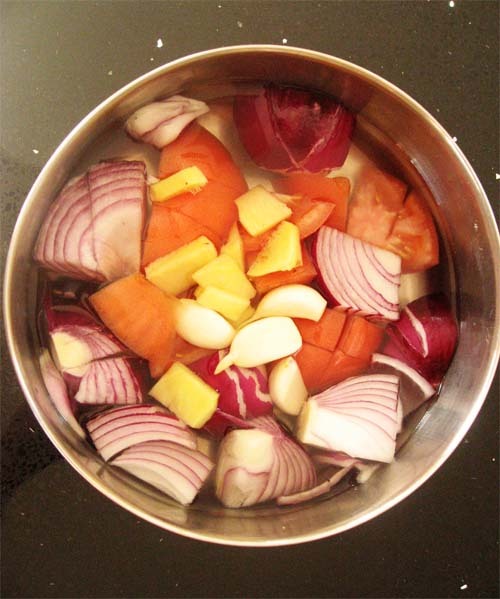 Fry the onion tomato till onion is soft and pink, tomato is cooked down and garlic, ginger is softer. You can fry them more till onion is browned etc. but this stage works well too. 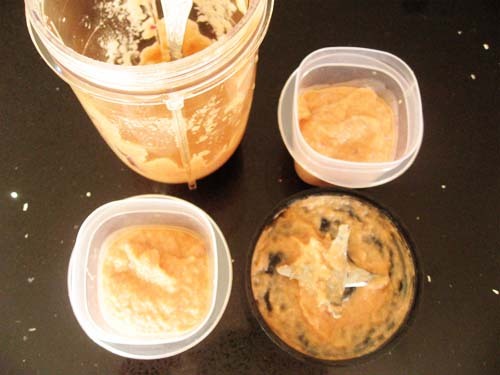 Now cool the above, put in a blender jar and with only splashes of water make a thick paste. Ta-Da. This masala paste will serve as your savior in most week days. Use it as a base to make different gravies. For the egg curry now boil 4 eggs. Once the eggs are cooked and peeled we will fry them. For this purpose, heat a tsp of oil in the same frying pan. Add about 1/2 tsp turmeric powder. Add the eggs and fry till the skin of the eggs blister and gets a pretty golden brown. Remove the eggs and keep aside. When the spices sizzle, add half of the the onion-tomato-ginger-garlic paste and fry for 2-3 minutes. Fry the masla with a sprinkle of water. Add a tbsp of Tomato ketchup and cook the masala. Once you see the oil seeping or that there is no raw smell, add about 1/2 cup of water, salt to taste, little sugar and let the gravy come to a boil. When the gravy is boiling, check and adjust the seasonings. Now add about 1/4cup of whole milk and mix well. Lower the heat and let the gravy simmer. Crush/warm a tsp of Kasoori methi between your palms and add that. Halve the fried eggs and add them to the gravy. Also add about 4-6 green chilies cut in halves along their length. Finish off by garnishing with chopped coriander leaves. This had been a hectic weekend. Wrapping up the final touch up for the book; the fonts, the typos, the excitement, the elation and then the depression. Until Saturday night I was on a high. Half of Saturday night had been spent online, working with my editor in India and chatting more working while she corrected those last little things. I went to sleep around 3:30 AM Sunday morning and by the time I woke up late on Sunday, it was like I had downed several tequila the night before. And this, when I don't drink and have never really experienced a hangover. If you have had a baby, painted, created music, worked on a project that sapped your soul, written a book, did anything that you loved so much --- you would understand what I am trying to say. My editor summed it up as "Post partum depression". And she was right. That is what it felt like. There it was, "my baby", the one I nurtured, fed, gave my everything, going out into the big bad world. No longer did I have any control on her fate. She was now left on her own, to chart her own path and be what she wants to be. I will be there to help, standing by the sideline, my heart in my mouth, but my work is done. I really, truly hope you all will welcome her like your own and be kind. For everything else I will be here. And if all this talk sounds too cheesy, wait, for there are sharper things in the next para. So anyway to quell the butterflies in my tummy I made a Shorshe Murgi yesterday night. Again. That pungency and hot green chilli will help clear my sentimental sinuses, I thought. 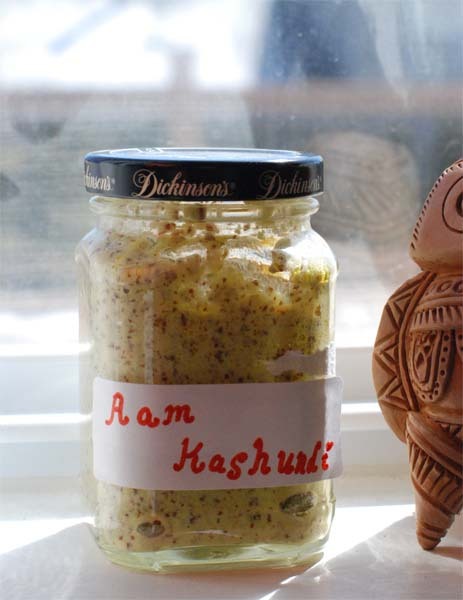 Now instead of homemade, if you have a bottle of store bought Kasundi , go ahead and use that. The only thing I worry is, that the quality of your Kashundi will control the dish then. If that bottle is not pungent enough, you can make a little shorshe bata(mustard paste) and add that to supplement the bottled kasundi. Whatever you do, go by the taste and smell and you will arrive at your destination...err at your Shorshe Kashundi Murgi. So raising a toast to my parents, my daughters, the husband, my friends, you guys and everyone who bore the brunt of my writing, with this " jhanjhalo shorshe murgi". For my excellent editor and her team, I owe you this and more. The book goes to print tomorrow. Amen. Now if you have bottle of Kashundi or you have made Kashundi from my post, USE THAT. Cook for half a minute and add the chicken pieces. Sprinkle some more turmeric powder. If the chicken is releasing water , wait till some of the water dries up. Mix well and then cover and cook till chicken is done. Taste, adjust and reduce the gravy till your desired thickness. Should be on the thicker side. Drizzle few drops of mustard oil to finish. Serve with steaming white rice. Sniff. Sniff. I need a hug. And some tissue. Before I write even one more sentence, let me dispel any doubts about this being the traditional recipe for real Kashundi or Kasundi. 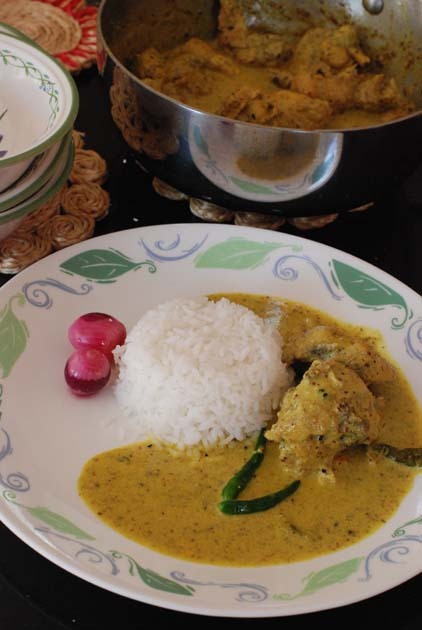 I don't know how to make the traditional Kasundi. My mother never made it. I don't think my grandmothers did it either. But my father's grandmother and grandaunt did. They were the designated Kashundi makers of the family. 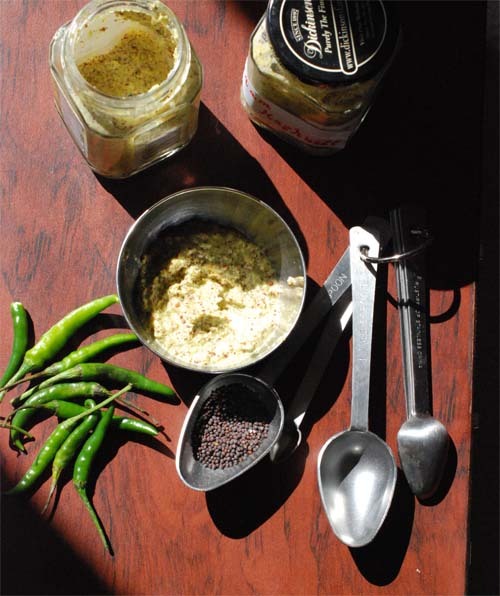 In the days when Kashundi was not bottled and sold, they were the ones who kept up a steady supply of that pungent, sharp Bengali mustard sauce in our home. My father's grandmother "Baro Ma", a highly esteemed foodie and a lady famous for her culinary skills, passed away when I was a mere year-old child.Sadly, I wasn't intelligent enough to absorb her kashundi making process in that early year of my life. My Ma as a relatively new mother at that time probably thought the task to be too daunting and never learned it either. My father's grandaunt then continued the tradition in her own home, and other than receiving couple of bottles of that mustardy goodness every year and discussing how grandaunt with her frail health still kept up at her kashundi making, no one in my immediate family ventured in that direction. "Khub shokto", "Very Difficult" is all that I heard. "The kashundi can be made only on certain days with utmost cleanliness and respect. You can not talk or touch anybody while making it. A little carelessness, and all that hard work will have gone to waste as the kashundi will get spoilt". By the time grandaunt stopped making Kashundi, small cottage industries and then brands like Radhuni etc. were selling bottled Kasundi like hot cake. We bought Kashundi from the stores and a need to make it at home never arrived. Those days, in absence of food processors and spice blenders, the brown and yellow seeds of mustard were to be ground on the sheel, the pockmarked slab of stone which is a major landmark in a Bengali kitchen. That must have been the "hard work" part. Now, when I pause and look back, I understand the "cleanliness" part, it was the same thing with achhar(pickles) and bori. In absence of any preservatives or refrigeration, it was necessary to maintain these standards for the finished condiment to have a long shelf life. Though my grandmother did not make Kashundi, she made bori in the dry sunny days of winter. It was an elaborate affair with the dal being soaked overnight and then ground next day in batches. Early next morning the bori making would ensue at the terrace where washed and starched spun cotton saris and dhotis would be stretched out, their corners secured by rectangular red bricks. My grandmother would take a quick bath, change her clothes and then arrive at the scene. Small dollops of the lentil pastes would be dropped on the those stretched cloth and left to dry in the winter sun. Younger children or the house help would be assigned the job to keep away birds from those raw boris, waiting to bake in the sun. However we were not allowed to go near, touch or poke those small mounds of lentil pastes. Those mornings we were not allowed to run around on the terrace either. The whole affair was shrouded in an environment of sanctity and we looked at "bori making" with lot of respect. Now here in the US, I get my yearly supply of Kasundi from India. This means I use it with much care, using it sparingly and trying to get most for the tablespoon of kasundi I use. I cannot be as generous with kasundi as I can be with soy sauce. The niggling doubt of what-if-my-stash-of-kasundi-does-not-last-until-Ma-visits consumes me on my worst days. So a few years ago when my blogger friend Sharmila @ KichuKhon vouched for another blogger Delhibelle's Aam Kasundi, I thought what do I have to lose. It also helped (a lot) that her recipe was super simple and involved nothing of the word "shokto" aka difficult. 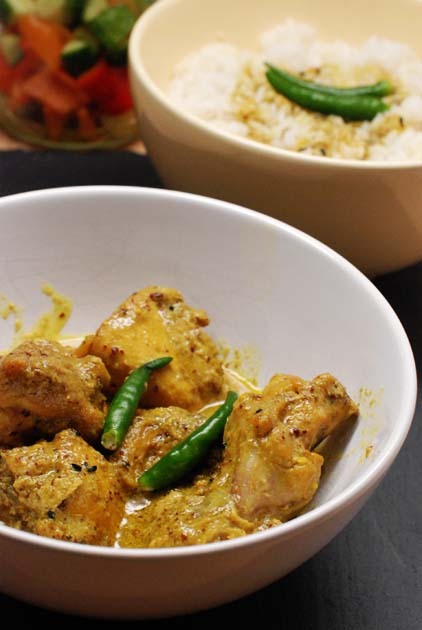 It used raw mangoes with mustard seeds to produce the tangy spicy taste. Maybe it does not exactly taste like the real Kasundi but so what, it comes close, very very close and believe me it tastes awesome. I have made this couple of times in the last year and recently made another batch. I refrigerate the bottles as I am not sure if they will stay good outside. Refrigerated they stay well for weeks. I mostly use it in dishes like shorshe salmon or bhapa ilish or in a shorshe murgi which I will share soon. It is also very good as a dip and with a bottle of it in your collection you will not miss the real Kasundi all that much. 4 tbsp Mustard seeds ( a mix of brown and yellow gives the best color but I had only brown this time). 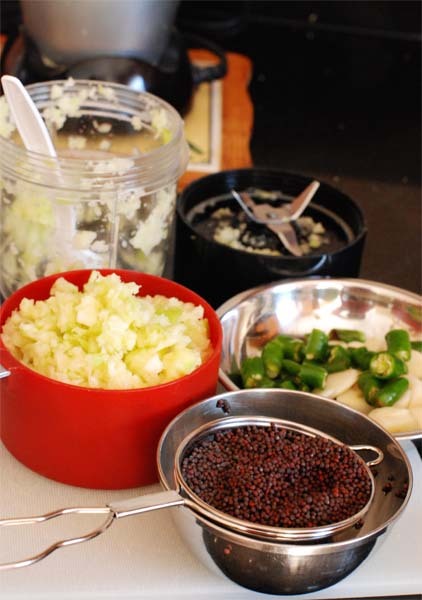 Ideally soaking for 30mins to an hour is best as it softens the mustard seeds for grinding. Add a splash of vinegar (approx. 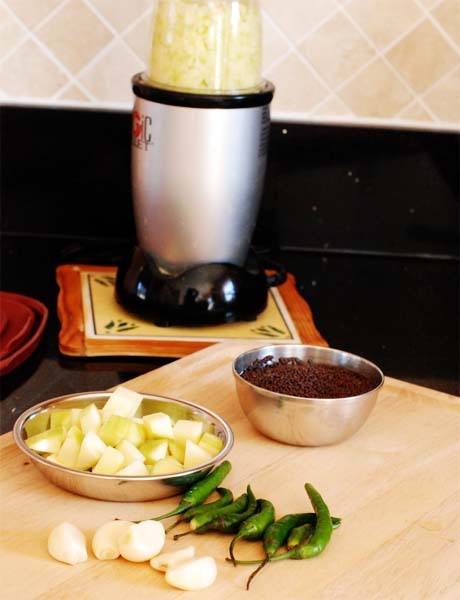 2tbsp) and 1/3rd Cup of Mustard Oil to the blender jar. Make a smooth paste. Try to make the paste in one go instead of pulsing. Pour out in a glass jar with lid. Top off with Mustard oil and leave it on the window ledge for a couple of days. Sometime back I received my signed copy of Prerna's The Everything Indian Slow Cooker Cookbook. Need I say, I was thrilled. The author Prerna Singh is also the author of IndianSimmer, a beautiful blog in its own rights. I have been a long time admirer of her blog and I was looking forward to her book. Given that I am not much of a slowcooker person and do most of my cooking on the stove top and use my pressure cooker far more than the slowcooker, I was curious too. But I must tell you that book is a treasure of recipes and they are delicious, slow cooker or not. 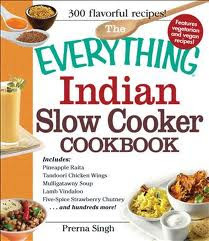 I liked the section "Basics of Indian Cooking" a lot which explains many of the cooking terms and spices used in Indian cooking.There is also a section on Basic Sauces and Spice mixes which has recipes for Pav Bhaji Masala and Tandoori Maslaa which I am making next for sure. There are fifteen chapters in total with an array of about 300 recipes encompassing appetizer to beverage. For the next couple of days, I will do a series of posts which were actually intended for February. I had planned to do them the week of Saraswati Puja because she being the goddess of knowledge and art and art and creativity was what my posts were going to celebrate. But things often don't go according to plan. Well actually things NEVER go according to plan. So instead of February, I will do the posts over the next few days. The entire month of February, I thought of Miri. Off and on. Off and on. I would go to one of my older posts and her comment would be right there. I browsed through her blog , going through her older posts, expecting new ones. And then I thought it was only befitting that I share the Goshtu recipe that she had sent me. The post was there on her blog but not the recipe and I had asked for it in the comment. She had promptly sent it by e-mail. here's the recipe I used - didn't want to post it because its Blog Bites and you are supposed to link to the original! Pressure cook moong dal until soft. Add onion and saute for 5 minutes till soft. Then the tomatoes, turmeric powder, chilli powder and sambar powder and saute some more till they are mushy. Add the vegetables and stir fry for 10-12 minutes till they are half cooked. Add tamarind water, salt and one more cup of water. Bring to boil and then simmer covered for 20 minutes. Finally, add the cooked dal, mix well and boil for another 5 minutes or simmer till it has thickened. Add coriander leaves and serve. I had actually been looking for an eggplant dish, I had tasted way back in an Office cafeteria in Bangalore and the Goshtu though similar had Dal which the cafeteria eggplant did not. Thanks so much for the recipe. Now that I read it, I realize though that this wasn't the cafeteria eggplant, this is like the one a Tam colleague used to get here. I have had this and really liked it. The cafeteria one had no dal as far as I remember." "You are welcome!... the cafeteria one must be with onions and tomatoes, but also sambar powder - I make a version of that with drumsticks and brinjal and its really nice. " But for a long time, I did not make it. It was one more of those recipes you treasure but don't always cook. Today I made it and it tasted delicious. Why was I waiting, I thought ? But we all do that. We wait and wait and wait until the moment has passed and things are not as they used to be. And then a known flavor, an unknown scent reminds us of what could have been. Today Miri lived in my home through her food that she had shared many months ago and I wish her and her family the best always. I am not posting a pic of the finished dish because hers looked infinitely better than mine, the eggplants in my dish were not as soft. I rather we remember the dish as it looks on her blog post. Perfect. These tikkis or croquettes are inspired by two people. Mandira of Ahaar and The IKEA people. 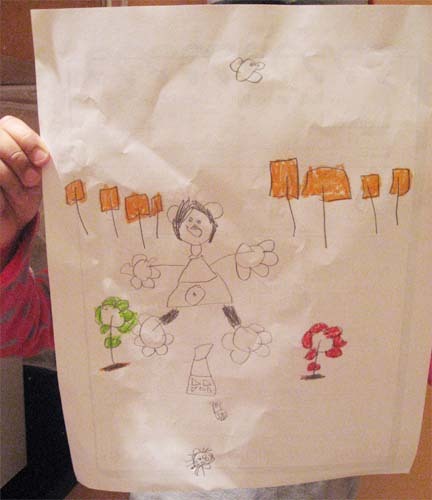 But before diving into them, let me pique your interest by showing you my picture, as rendered by our in-house artist LS. Did you see it ? Did you see it ? Ain't it cute ? She has made me look so good in there. My adult acne and thick moustache has been totally covered up and my flowery feet and similarly flowery fingers have been accentuated. My arms look toned and my ears round and well formed. That girl sure knows how to bring out the best in her subjects. And did you see the belly button ? My belly button ? That big round circle with a dot is apparently my belly button. She pushed up my shirt and confirmed that body part. "Oita tomar belly button", she said with conviction. "Really ? " I thought. "It pops out like that ? Why did no one ever tell me about this wardrobe malfunction of mine? Or is that my tummy is so big that it surfaces as the most prominent part like the tip of an iceberg ?" No idea which is what, but it must be true, given that it is the artist's view and all. I had thought that after completing its foremost important job of connecting me to my Mother, the belly button had taken a retirement package. Looks like it has resurfaced. So any of you interested in getting a better-than-real portrait drawn, e-mail me please. We are still accepting orders. Now to these tikkis which I had set my mind on when I first saw them as cutlets at Mandira's Ahaar. Then one fine weekday morning, I had the rare opportunity to go to Ikea. I had never seen the interiors of IKEA on a working weekday morning before and I am telling you, it is an experience. Whole lot better than a weekend one. The best thing was the cafeteria, where for once there was more food than people.Over and above the fixed menu items, there were many other edible stuff and the broccoli and potato medallions which I added to the tray as an afterthought was the best find after the Hemnes mirror. Those were really good and I could only think that it would only get better with Mandira's sweet potato idea. When I came home and googled though for Ikea potato and broccoli medallion copy cat recipes, I got this. I had no whipped cream but I had parmesan. Also I wanted to use sweet potatoes. When done, those Sweet Potato Broccoli tikkis turned out great. I have packed them for school lunch along with bread. You can make a sandwich with them as the patty but BS did not like that idea, instead she wanted them separate. You can also wrap them in a roti and that is how she had them for dinner. 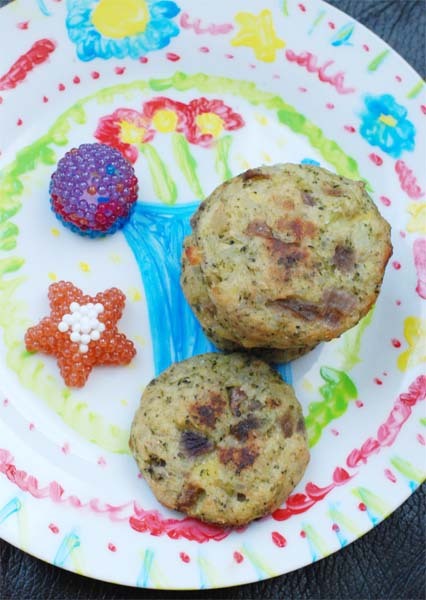 For the recipe of Sweet Potato Broccoli Parmesan Tikkis check my kid's blog where I am storing Kid's Lunch Box ideas. After a long long time I bought Goat keema today. Made fresh at the meat store. It was natural that I would make a Keema Matar with it. What we call Keema Koraishuti. That one dish serves a lot of purpose and also freezes well. So, today we are going to have just the keema matar with rice for lunch. Tomorrow, I will dry up some of it, add a boiled egg and make sandwich. On Wednesday I will defrost the portion I am freezing today, toss it with rice or something and concoct one more dish. If I am feeling particularly creative, I might also toss some pasta in it. This is going to be an easy week. Good job Keema Matar. 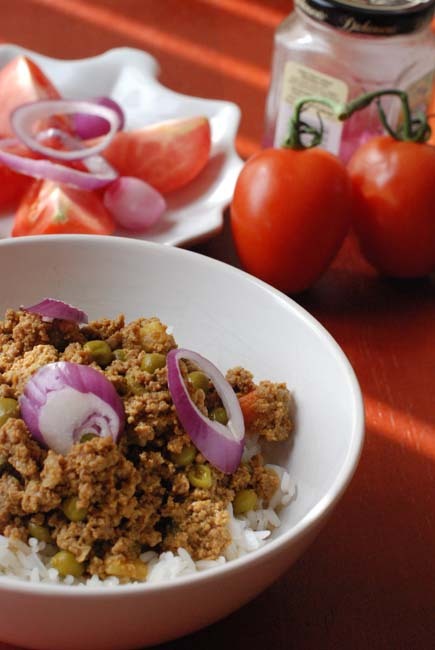 The recipe is exactly same as my old one -- Keema Koraishuti. Only this time I used the pressure cooker. Jhaal in Bengali means hot. Not warm hot. Not "pink hot". But spicy hot. But "jhaal" when in the name of a dish describes a gravy based dish (should have said curry, but don't want to add to curry culture) usually with mustard sauce that is thicker than a soupy "jhol" but not as rich as a "dalna". Confoosed ? Confused ? Okay forget it. Jhaal and hot brings to my mind a very funny incident. I know a little girl, a neighborhood friend of my daughter who watches a little too much of Disney Channel. Well probably a lot of Disney Channel. If you are not a parent or do not subscribe to cable, both good choice, you are probably at a loss here. "Disney" you think is all cutesy innocence, magic kingdoms and animated characters. Well, welcome to the Disney Channel on cable and spend some hours in the evening watching the shows they offer, and then come back and read this post. It is better for young kids to watch back to back DDLJ than watch iCarly . So any way this kid who watched a little too much of the channel, one day comes to my home in a new dress and tells me ," BM auntie, you know I am hot". Being genuinely worried, I touched her forehead and said, "Do you have a fever ? your forehead is cool. You are not sweating either". Balking at my ignorance, she exasperatedly said "No. Not that hot. Hot -- like in hot pink". By now I had a grasp of what she had in mind, but knowing her for a long time and her obsession with the channel which probably led her to this imaginary self-obsession, I tried to play it down. "Actually Hot in English language has only one meaning -- having a high temperature. And in some cases we use it for food which is very spicy. Never have I heard that being used to describe a person," I said, acting innocent. Seeing that this was going nowhere and probably thinking of me as some bummer from an Indian village, she gave up on me. She also stopped all her preening and twirling and got down to more earthly business. "Can I have an oreo cookie ? Or two ?" she tried to negotiate. "You can", I said. "But don't you say you are hot unless running a fever or feeling warm. You need to be older to understand different meanings of a word and only then use it". Don't know if it had any effect on her but she is a good and smart child and I hope the self-obsession was momentary. What do you do when faced with kids saying "grownup words" or acting "much older than their age" ? Do you give a stern scolding ? Do you sit them down and give them a lecture ? What do you do ? Back to the food, this shorshe salmon is a quick dinner option on a weekday. All you need to make is the mustard paste. And then the best thing is, you make it different from the regular mustard paste. The way I do it, I make the mustard paste with mustard seeds, poppy seeds, green chillies, tomato and garlic, flavors which go very well with the stronger taste of salmon. 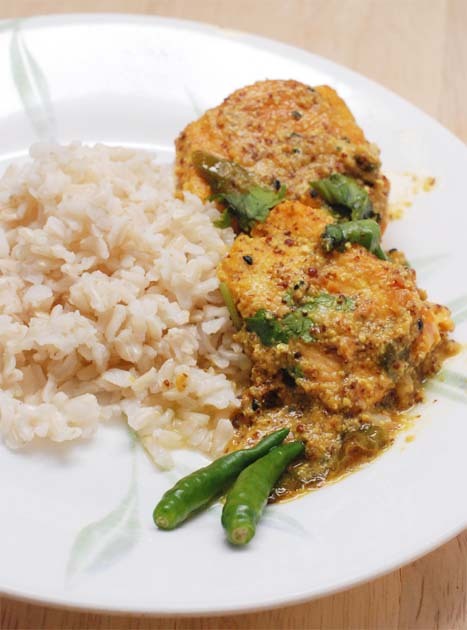 If you don't want to do the jhaal, you use the paste as a marinade and bake the salmon instead. Else you make the Shorshe Tomato Salmon Jhaal. Add the fish pieces and lightly fry till the fish loses its raw coloring. Next add the mustard paste you made. Lower the heat and mix with the fish till fish is a pale golden color. Do not over fry fish or crisp it. Add warm water enough for gravy, salt to taste, cover the pan and let the gravy simmer. The gravy should be on the thicker side and clinging to the fish. Garnish with chopped coriander leaves.